vintage brass cow ear tags onto old horseshoes handcrafted into stands. Each runner received the cow tag that matched their bib # when they finished. 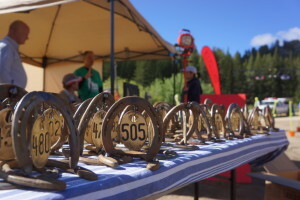 The top three men and women finishers in each race were awarded a horseshoe runner. These were very special awards that will be hard to match in the future. 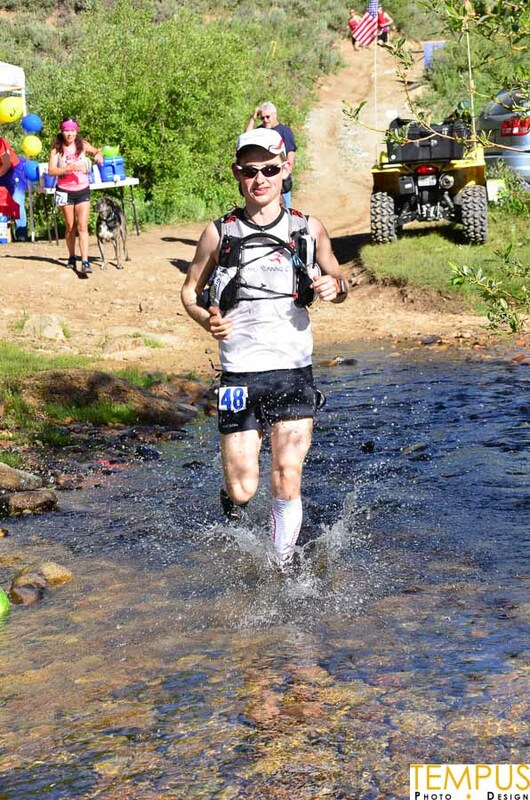 The men’s 100k was dominated start to finish by Owen Bradley of Birmingham, Alabama, who set a course record of 12:09. Cougar Hall of Eagle Mountain, Utah took the second spot, while Washingtonian Justin Jablonowski finished third. Top local runners Jayk Reynolds and Jeff Black of Boise rounded out the top five men. Jeff’s report to follow. On the woman’s side, out of state talent dominated as well. Meghan Hicks ran a consistent effort from start to finish, ending up with a solid lead and the second overall spot. Wendy Wheeler-Jacobs of Redmond, Oregon took the second spot, with local Boise-area ladies Lyn VanSchoiack, Christine Kollar, and Lynette McDougal rounding out the top five women. 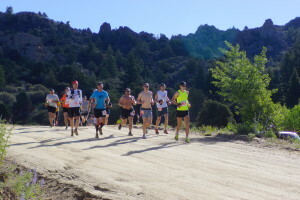 A fun surprise for runners at the start line was the announcement of a small cash prize for the top man and woman to the marathon mark of the 100k, which was also the high point of the race, Hayden Peak at 8400 feet. 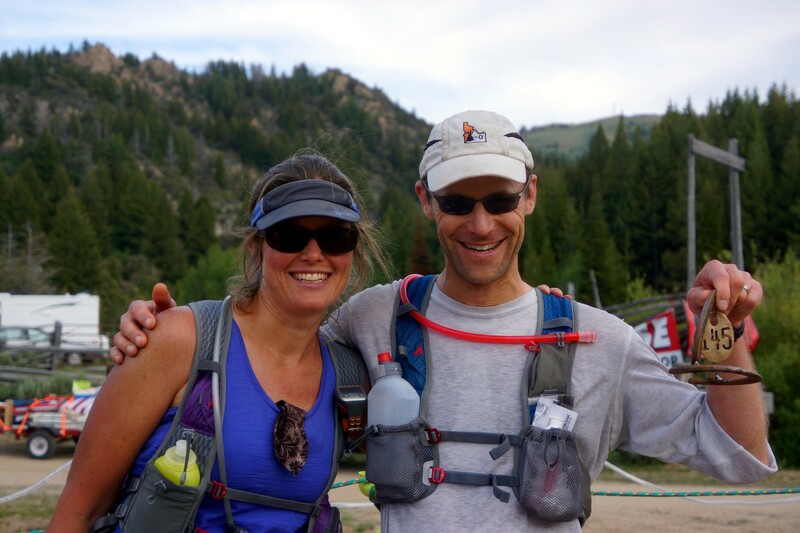 Owen Bradley and Lyn VanSchoiack each collected their cash at the finish line. Once in a while it happens. There is an occasional glorious, lucky day when all the elements come together: training, weather, food, experience, competition, and the course itself. One can control some variables and try to be prepared for the unexpected, but the outcome is never sure. This time it all nested neatly into a single well executed race that made it look like I knew what I was doing. It was one of those grand days! Training and experience: check. 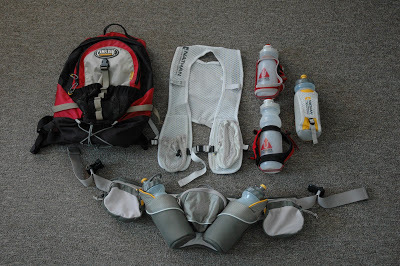 I built up recently with a 24 hour and a 50 mile, key learning experiences over my first 50k. Weather: check. With snow and rain earlier in the week race day was overcast and cool with no dust on the ATV trails. Competition: check. 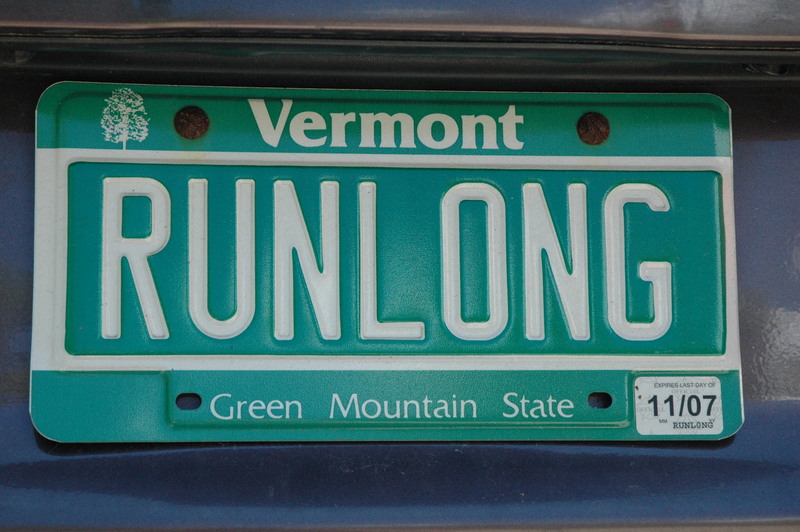 I knew others right around my pace this year. As for the course, there was a vast green table 100km long with nearly 15,000 feet of gain. The cards were ready. A fast Silver City 30k start. since a lingering puzzle in this ultra game was late stage muscle fatigue, especially my quads. I played with knee flexion and form while the dawn broke through the Idaho sky. The light gleamed on black volcanic track ribboning over golden hills, wildflowers shimmering. As I paused on a saddle, my friend Tony came up behind me. We gave chase after others as I practiced keeping up with him on the rocky downhill. He made it look easy as usual. At bottom I pulled out my uphill stride. A minor hand played. At loop end, I enjoyed a pancake at Slacker’s Corner that friend Dennis prepped for me on a yellow plate lined with happy faces. Tony generated a breeze in passing, grabbing M&M’s and firmly rejecting Dennis’ shoulder to cry on. Next was a fast downhill and upstream into Silver City proper. After I passed Tony and the quiet ghost town buildings in various states of repair, signs appeared: Holy Sore Feet Batman! and Green Lantern’s Light Ahead. 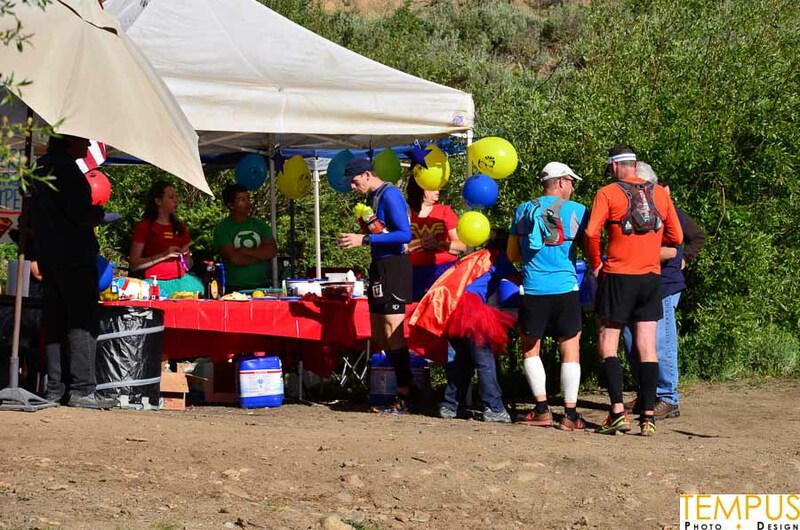 Everyone was geared up as a superhero at the aid station, with a spread fit for runners needing ultra powers. Where was my cape? Sean Olson leaving Silver City Superhero aid station. 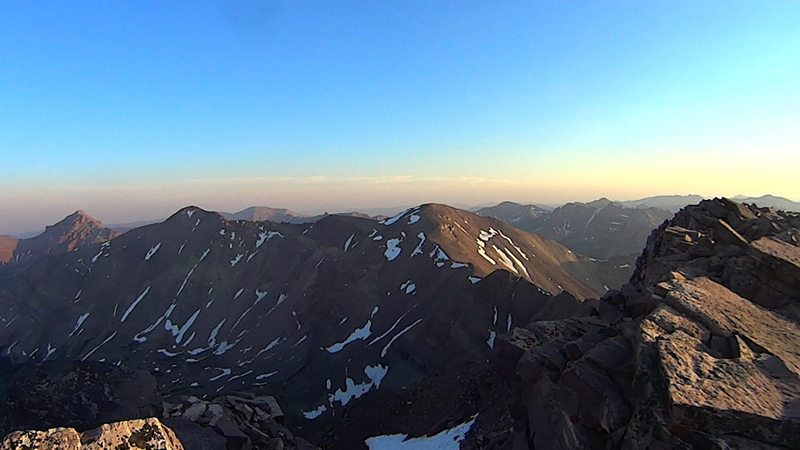 I climbed hard around War Eagle mountain, which was halfway to Hayden Peak and into thinner air. After the saddle aid station came a tricky scree hill and several 50k-ers including my wife returning from the summit, making for a good distraction. With the final rocky turn most of the 100k competition appeared. At the 8400’ summit came tremendous views under the overcast sky. There were plenty of rabbits to catch on the descent. I moved up a couple places getting back to the aid station where I slurped chicken broth. After winding my way south of the main ridge, it was down, down, down then, back to Silver City. The trail galloped along the creek bed as clouds left and sun poured in. Quads were tested but with another superhero sign, the day was saved. Green Lantern offered me a grilled cheese sandwich, but I noticed the giant pickles and hoped for superpowers as I munched one. I put the cape back on but back in town I felt akin to Clark Kent as ATVs buzzed by and I made my turn. The route wasted little time heading upward. Hiking fast through creek crossings, I reached ruined buildings neighbored by a long-abandoned bulldozer and wondered what the story was. I could hear active bulldozers working the hillside higher up on a mining claim. After countless grinding switchbacks into eerie solitude, I came to appreciate the name of Long Gulch. I reminded myself I was in a race. 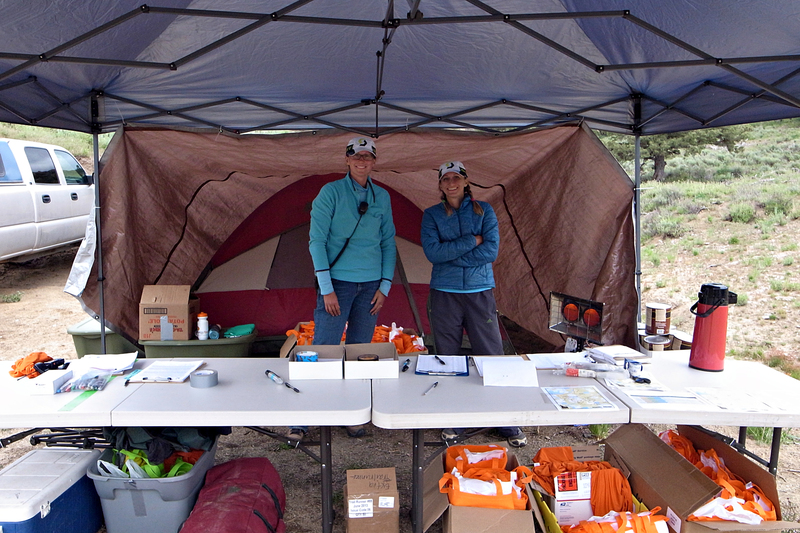 Finally the aid station appeared and cowbells sang the sound of music. Jeff and Dondi Black, cards well played. surprisingly good. My stomach was excellent, I was drinking enough, and the best part was my quads still felt workable. Perhaps I got some good cards. I kissed my wife goodbye as she said her goal was to beat me to Slacker’s, and cruised into Jordan Creek station asking for more pickles. After pausing a moment in the cool waters, I had the infamous hill to myself. It was all loose rock up 1200 feet in 1.2 miles, but seemed manageable even with the false summit. I paused on top for the 360 degree view and caught my breath, and then it was a long solo downhill into the Delamar station. I was delighted to see Ryan seated in a chair and I joined him to refuel. We relaxed a little until Tony blasted down, and Ryan anted up and headed out. I hung out a moment longer, just to see the gleam in Tony’s eyes. The last hand was dealt. I caught Ryan slogging up into aspens under a steely sun. I accompanied him until Tony popped out of the trees with fire in his eyes, and I called his bet. As he drifted ahead of me through fields of white he seemed to be winning a bluff, but I pushed longer on the ups. Then we were neck and neck again, and he fell back for the last time. 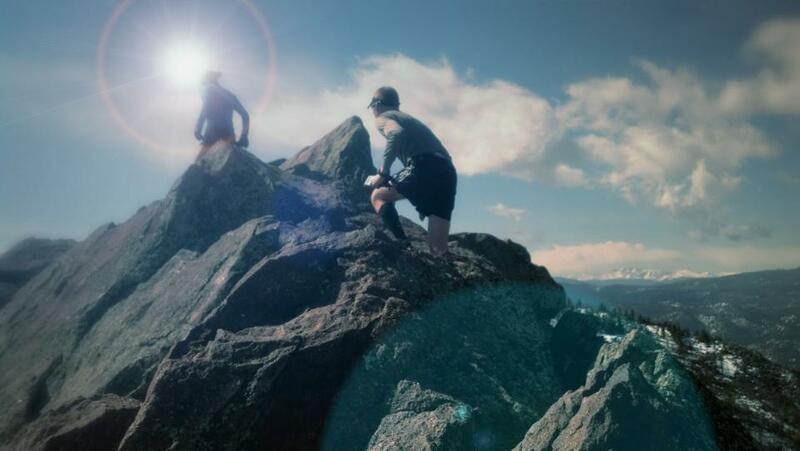 The nine mile haul included an unnamed climb that existed solely to test our spirit. I grinned inside as my cards were good. My legs took me up, and I pulled Slacker’s to me. Silver City 50k Second Place Male Mark Wheeler leaving Slacker’s Corner. 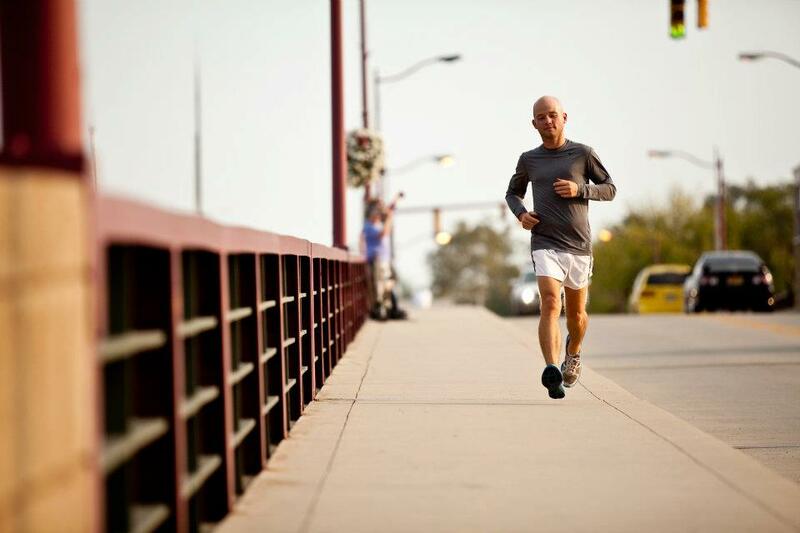 As I arrived a runner took off post haste. With a pep talk and calories came another crucial pickle to settle my stomach. I left with nobody in sight. I ran all the downs and pushed hard on the ups. As I descended steeply to the road I saw my quarry. It was not in the cards to catch him, but I enjoyed an open stride and made the final switchback turn only a minute behind to finish in 13:47 – and 20 minutes ahead of Tony. I collected a handmade horseshoe finishing prize from tireless directors Emily and Davina, hugged my wife hard (she beat me there), enjoyed a bowl of chili with friends, and finally reflected just how fun these ultras can be given top notch aid stations and…pickles. Food: check. It was a grand day indeed. Deal me another! 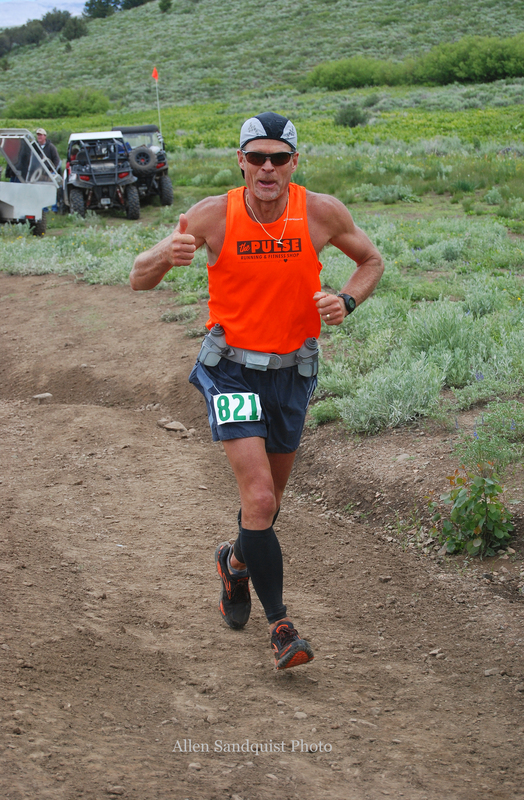 Next up in the Idaho Trail Ultra Series: Wild Idaho Endurance Runs 50M/50k 2 hours north of Boise on August 3rd; and Idaho’s only mountain 100 miler, the IMTUF 100 on August 30-31, 2013 in McCall, Idaho. IMTUF 100 is a gem in the alpine playground around McCall, Idaho.